Something that pisses me off in a game is paper money. Any money item that I must stock, count, hide, spend… is usually tedious to handle. I understand that, in a economic management game, it is pretty basic to have a depiction of money available but, what happens if your game has an economic side just as a secondary thing? I love the game Power Grid. It is a true solid euro game, in the highest difficulty rank and with auction, area control and economic management mechanics. Very cool. The only thing that does not fig: the electros. 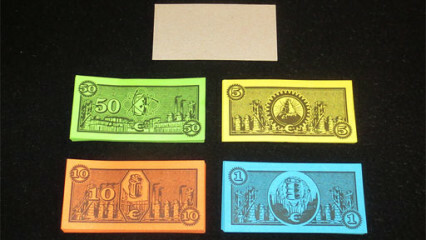 Electros are the money currency and the game has paper bills, Monopoly alike, for this. This is simply unviable. For this reason I keep a bag with poker chips in my Power Grid box, which are handled and counted in a much easiest way. But this is just a plain switch in game components, it is not a change in the mechanics about how economic resources are manipulated. Power Grid is a game where economic management has a very strong presence. How can we model different economic levels without using money? What happens if my game is mainly narrative but I want to introduce different wealths or resources for the players? That is how I reached this draft of a system that I call Sherwood System. The exact amount of money that a player has does not imply narrative issues. In a game with just a bit of roleplaying, money psychs out interpretation. Granularity is high. I mean that all cases can be reached: a player may have 1 coin or 100 coins and this must be compared with all amounts of other players and other game elements. The number of possibilities is huge usually and I feel that this is not exploited. If money is used to buy things and there are 10 things to buy, does it make any sense that so many money was in play? Couldn’t the objects being cataloged in 5 or 6 groups and let or forbid the player the access to them? This is the key question for me here. Getting rid of paper money. Instead, resources are available or forbidden for a player, depending on his or her economic status. There are no amounts of money but, literally, economic levels. I propose four levels in the initial concept: poverty, survival, wealth and richness. Victory conditions do not depend on economic level. In each level access to different resources is allowed. These resources are forbidden for different levels. These resources are designed so they do not bias the very victory conditions, but just the game mechanics, so each player must use his or her resources in an efficient way. In current real life it is very probable that “victory conditions” were more accesible for high economic levels, but just if we assume that victory comes from material wealth. If your game is about compassion, that does not have to be like that. Also, it can be played so each player starts in a different economic status and they must thrive economically to win. But this would be just partial victory and this always would depend on game context. It must not be taked for granted that money equals victory. In the system I propose there are 4 accesible levels and in each level there are 3 different resources. This makes 12 resources. For 12 kind of resources you do not need a system with coins to the hundreds: you simply order those 12 resources and allow or forbid access to them. Imagine that we want to design a game about Robin Hood.. For this we will have three factions: the Merry Men of Sherwood (thieves), the authorities and the peasants. Imagine that we want a narrative game where thieves feel like thieves serving the peasants and the authorities play as greedy and despotic guys. 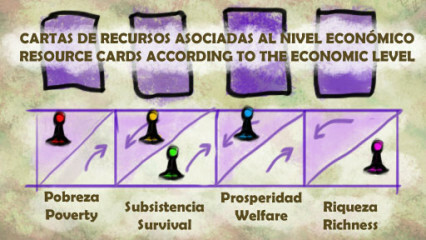 A player can take 3 resource cards of his or her economic level per turn and keep 2 or take 1 of an adjacent level. The faction leader can choose to lose 5 cards of the next level from the hand to ascend one level. Going from the lower step (A) to the higher (B). 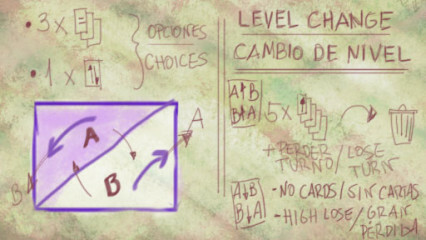 Going from the higher step (B) of a level to the lower (A) of the next, costs 5 cards of the higher economic level.